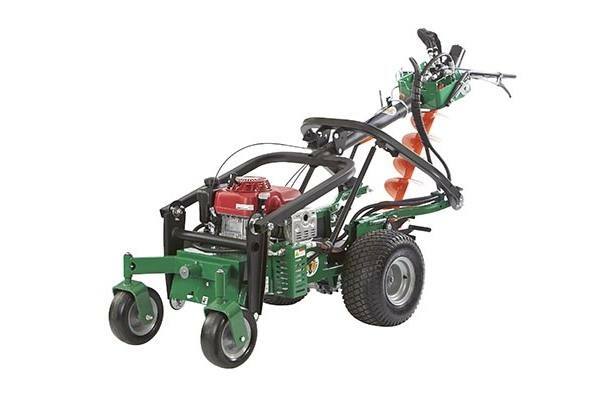 The Billy Goat AGR1300H Auger is ideal for fence and deck building, sign installation, park & rec departments and rental, offering fatigue-free drilling and easy hole-to-hole transport for one person effortless operation. Combined with simple no-towing-required transport, there's no quicker and easier way to tackle what can be a daunting and time-consuming job. The unit conveniently ramp loads to a 6' truck bed in seconds, and fits compactly with the tailgate closed, without having to remove the bit. Patent Pending Z-Link™: Offers a straight line drilling motion with minimum machine repositioning. Gas Spring Lift Struts: Assists the operator when lifting the bit from the hole, reducing fatigue. Operator Controls: Intuitive, fingertip access with variable speed hydro-drive forward and reverse. Drive controls are consistent to other Billy Goat hydro-drive machines for a consistent “feel". Spring Loaded Parking Brake: Located on rear wheels, helps to stabilize the machine for straight-line drilling on uneven or sloped terrain. Drill Control: Fingertip access located near hydro-drive controls for convenient operation. Larger 13 Gross HP Engine and 10 GPM Pump and Motor Package: Produces 350 foot-pounds of best in class bit torque. Easily handles 2" - 18" bits. Pivoting Front Wheel Caster: Provides smooth transport to job site and from hole-to-hole along with high flotation rear turf tires. Auger Bit Position During Transport / Drill: For compact efficient transport, bit locks in a forward transport position and easily clears the ground for simple moving hole-to-hole. Unlock both the transport handle and pull the quick release pin to swing the bit into position for vertical drilling. The bit can also be positioned and locked to a left or right angle when working on hills. 6' Truck Bed Transport - No Towing Necessary: No bit removal necessary for transport. Fits compactly in the pickup bed with tailgate “up". Ramp Loading: Loads / Unloads in seconds. Self-propelled makes transport, loading and unloading simple and quick.